Glowing tributes were paid to Dr. B.R. Ambedkar in the city on the occasion of his 62nd death anniversary, observed as Mahaparinirvana Divas , on Thursday. Many recalled his tirade against untouchability, contribution in drafting the Constitution and championing the cause of social justice. 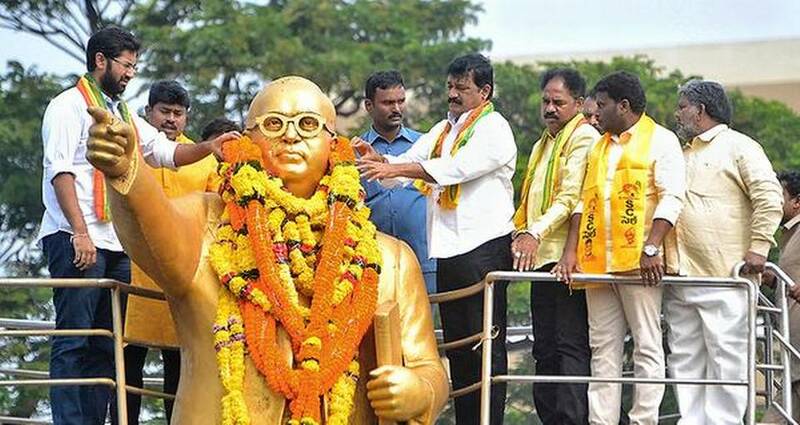 HRD Minister Ganta Srinivasa Rao garlanded the statue of Dr. Ambedkar near LIC building and described him as an educationist, reformer and an eminent lawyer and statesman. TDP MLA Vasupalli Ganesh Kumar and GITAM president Sri Bharat were also present. Tribal Welfare Minister Kidari Sravan Kumar garlanded the statue at Andhra University campus and narrated how he fought for the rights of the oppressed classes. The faculty, employees and union leaders of AU garlanded the statue of Ambedkar and took a pledge to popularise his teachings. HPCL Visakh Refinery organised a blood donation camp in association with Rotary Blood Bank. HPCL Visakh Refinery executive director A.S.V. Ramanan highlighted his contribution and reiterated the commitment of HPCL in realising the vision of Dr. Ambedkar.